I'll be honest, the live action "based on a true story" Disney films never really appeal to me. The best one Disney has made (in my opinion) would be Cool Runnings (which I reviewed here). Most of the other films of this type are below Disney's standard and seem to exist only to make a few bucks to feed the actors. "But Chris Pine is in it!" you say. "Surely the movie is wonderful if such a big shot Hollywood actor is in the film, right?" Not neccessarily. Chris Pine is a good actor, yes, but *gasp* he's not as well known as some. Sure, he has a fan base, but it's not nearly the size of Broncohat Cottonlatch's or Tom Hiddleston's. Besides, the only things anybody (read: I) knows him from is Star Trek and Into the Woods. Thought no. 1: WHY IS IT SO MUSHY?! I'll be honest, I am a mushy movie person. Hallmark Channel was my life in middle school. However, the mush seems poorly placed here. It feels like it's here so people can squeal "aww" before they think everyone is about to die. Why is it necessary? Thought no. 2: It is very dramatic. This is why some things should just stay in real life and not have a film. The trailer is a lot of yelling coordinates and screaming at waves. It's almost a thriller movie, not a historical experience. I don't think that this film will get much of an audience. It looks very well done, and the actors in it are not without acclaim, but since a competing film (also with big waves and actors with similar hair) has already been watched, I doubt this will get as much popularity. 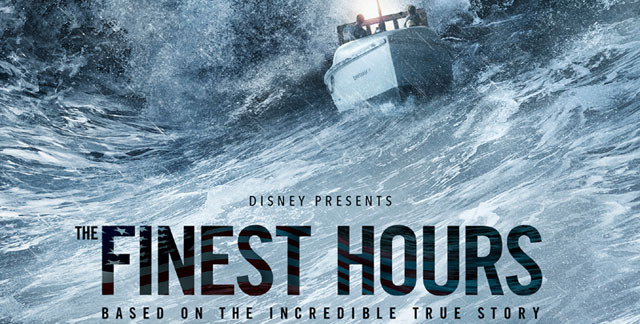 The Finest Hours hits theaters today, January 29, 2016.